Ideal for hanging keys, small decorations & party lights. High performance adhesive - holds on strongly. Each hook holds up to 225g / 1/2 lb. 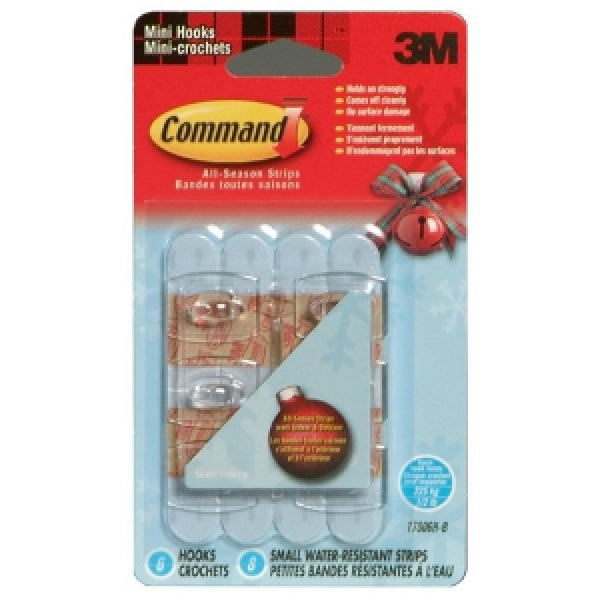 Includes 1 pack, with 6 resusable mini hooks and 8 adhesive strips. Dimensions - (HxWxD) 30mm x 20mm x 10mm. Replacement strips available - use Command™ Poster Strips. Command™ Mounting products and adhesive strips offer a new means of attaching, holding and hanging without the fear of wall damage or leaving adhesive residue. Combining a genuinely effective high performance adhesive with a stretchable backing, Command™ adhesive strips hold strongly, yet remove cleanly.